CTV Atlantic is the number one television station in the Maritimes, known for its top-rated local news programs and primetime lineup. The station produces close to 30 hours of news and information programming each week, including the CTV News, CTV News at 5 and CTV Morning Live. CTV Atlantic serves four provinces with two stations - CTV and CTV Two. CTV broadcasts to viewers in Nova Scotia, New Brunswick and Prince Edward Island. CTV Two covers all of Atlantic Canada, including Newfoundland and Labrador. CTV Atlantic produces several newscasts a day, relying on reporters from around the Maritimes to find and share stories important in their communities. 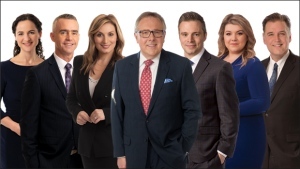 Having been in this region for decades, CTV Atlantic has a loyal following of viewers who make each of the local CTV News programs the runaway leaders in their time period. CTV Atlantic also broadcasts many of Canada's top-rated television programs, including The Big Bang Theory, MasterChef Canada and The Amazing Race Canada. As a result, CTV Atlantic consistently dominates television ratings for all demographics. CTV Atlantic is also active in the community. The station contributes funding, resources and time to a large number of charitable organizations – particularly those supporting children. Of its most important commitments, CTV Atlantic is very proud to produce and broadcast two telethons. The longest running is the annual Christmas Daddies Telethon, which is now in its 51st year. Since its inception, the show has raised close to $30 million to assist local children. CTV also works closely with the IWK Health Centre Foundation to produce its annual IWK Telethon for Children. It is Atlantic Canada's largest fundraiser in support of the regional children's hospital. These and other events are an important part of CTV Atlantic's service to the communities in which it has proudly operated for more than three decades. CTV Atlantic is also growing its digital presence, through social media and our website atlantic.ctvnews.ca. Through our digital properties, including Facebook and Twitter, CTV Atlantic is extending its reach by providing more news, more often.